I think I must have posted too many recipes that use cream cheese. 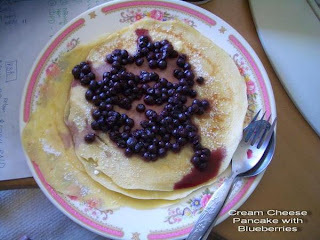 This time, it's cream cheese pancakes with blueberries. It is very easy and uses the pancake flour mix I posted earlier. I used to make this a lot back in Australia because cream cheese is really cheap there; only AUD1.40 for 250g of cream cheese. Combine flour and sugar in a large bowl; make a well in center of mixture. Combine egg and next 4 ingredients in a small bowl, stirring well; add to dry ingredients, stirring just until moistened. Using the tip from art of pancakes, we let our batter rest for 15-20 minutes before cooking. Pour 1/4 cup batter for each pancake onto a hot, lightly greased non-stick pan (medium sized for me). Cook pancakes until tops are covered with bubbles and edges appear cooked; turn and cook other side. Serve pancakes with what you like: maple syrup, peanut butter and maybe even crisp sausages and bacon. I served mine with blueberries (those from jars). Oh yeah, don't forget to sprinkle some icing sugar on your pancakes too! NOTE: 1/4 cup egg substitute, skim milk, and light cream cheese may be used. Pancake batter will be thinner and will cook faster - also less fat. This should make 10-12 four inch pancakes. Ihsan: It's up to you - I used the ones from a jar. mmmmmm! mmm, mmm, mmm! and your writing is so lyrical! i could see your recipes set to classical music. you could make the first audio cookbook with appropriate orchestra in between instructions for ample preparation time. "the world's first orchestrated cookbook!" i would actually find whatever fruit is fresh and throw it into a saucepan without any help. use a nonstick, medium-high heat until things start to break down and then a low heat, stirring every coupla minutes. within 20 minutes any fresh or frozen fruit will have broken down so much and so slowly that they will taste sugary and be syrupy without any added ingredients. even cranberries or sour blackberries you wish you'd never bought! try nutella in between pancakes to create a berry chocolate stack. you can still butter the top pancake!